Hunter Douglas Architectural is proud to have been specified for a new £40 million hospital in London that has replaced buildings dating back to the Second World War. The leading global architectural products company has supplied 278m2 of its leading solid wood linear ceiling to help create a warm welcome for staff, patients and visitors to the Royal National Orthopaedic Hospital (RNOH) in Stanmore. It is the first stage in the RNOH NHS Trust’s redevelopment of the site and will comprise 8500m2 accommodation over five floors. Hunter Douglas Architectural was specified by architect BDP to provide Siberian larch for the ceiling in the atrium, which tops a five-storey open and fully glazed entrance to the hospital. It supplied panels in random lengths from 900mm to 2500mm in 111mm module width. The Class O treated larch had UV-resistant varnish and it was pre-fitted with an acoustic fleece to the open joint. MPG Contracts installed the panels, which are designed with a pre-fixed clip system to ensure faster installation, onto a Hunter Douglas Architectural metal suspension rail. The clips for the linear system allows for the panels to be provided as 50% demountable. Juliette Halliday, national sales manager at Hunter Douglas Architectural, said its solid wood linear ceiling and wall systems are developed to maximise efficiency. “The Hunter Douglas Architectural solid wood linear ceiling is an extremely popular choice for specifiers and architects because of the unique manufacture and fitting system,” said Juliette. Ged Maye, director at MPG Contracts, said it had worked with Hunter Douglas Architectural and its products before, but this was the first time it had installed the solid wood linear acoustic ceiling system. It was impressed with both the product and ease of installation. 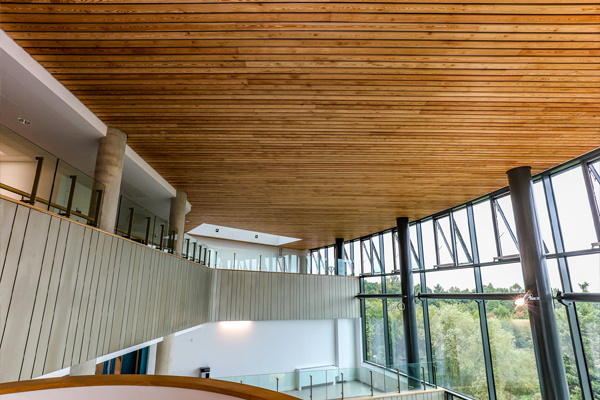 “Our client had specified the Hunter Douglas Siberian Larch timber slat ceiling and we worked closely with the Hunter Douglas technical team to ensure the installation went as smooth as possible. Hunter Douglas was very supportive and willing to provide assistance when required,” he said.